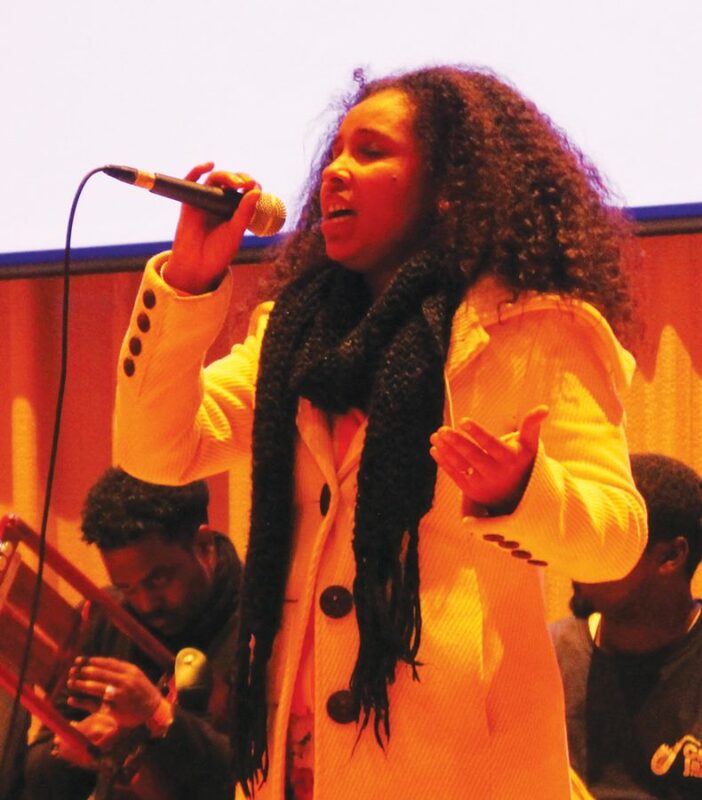 Selamnesh Zemene from Ethiopa performs at the lecuture in the Center for Faith and Life Recital Hall. The Nile Project, a collective of musicians who collaborate and engage with citizens living along the Nile River, performed on March 4 in the Center for Faith and Life (CFL) as a part of the Center Stage Series. They also gave a lecture on March 3 to explain the issues surrounding the Nile and how the group formed. The Nile Project was formed in 2011 to build cross-cultural connections through music as a response to the rising geopolitical tensions regarding the Nile river basin. The river basin includes 11 countries of various economic states and cultural histories: Tanzania, Uganda, Rwanda, Burundi, Democratic Republic of Congo, Kenya, Ethiopia, Eritrea, South Sudan, Sudan, and Egypt. In the lecture, Nile Project Producer and Chief Executive Officer Mina Girgis discussed the importance of communication to cultivate sustainable choices regarding the future of both the river and the people that depend upon it. Assistant Professor of Environmental Studies and Political Science Rachel Brummel explained what makes the issues regarding water in the Nile River basin so complicated. Brummel added that the large number of countries within the Nile river basin makes it one of the most complicated watershed issues. The musicians worked to build collaboration across diverse communities and to incorporate differing music styles and modes into their sound. The result reflects the diverse cultural and musical traditions within the countries they come from. Audience member Sam Poppen (‘19) appreciated the unique musical style. Throughout the performance, the musicians explained the history or origins behind instruments they were playing. One of the musicians stopped to introduce the Ugandan adungu, a multi-stringed instrument that sounds similar to a ukulele. Another musician introduced the Burundi iumuduri, which is a bow like instrument that is hit with a stick. The musicians encouraged audience participation through singing and clapping. Performing Arts Committee President Sheri Schwert (‘17) explained that PAC tries to bring musical groups that will connect to the Luther and Decorah communities.